Soldak Entertainment has carved out a niche for itself among the indie RPG companies: throwing the player into a unique, dynamic world that has a life of its own, regardless of what the player happens to be doing at the time. Drox Operative is their latest offering, throwing you into a sci-fi world with a variety of races, a unique history, and a plethora of options to choose and challenges to pursue as you struggle to bring glory and power to your guild by any means necessary. If you can cope with the relatively average graphics and the slightly overwhelming interface, what you’ll find is a refreshingly unique game that offers a tremendous amount of replay value for a low cost, a practically endless amount of challenge and most importantly, a whole lot of fun on top of it all. Drox Operative throws you into a world that is strongly reminiscent of Galactic Civilization. Each game generates a dynamic world filled with a selection of alien races, all of whom are going about their own business – growing in power, seeking new technology for themselves, declaring war on each other and otherwise going about the messy business of existing in a sci-fi world. While you can choose to start as any of these races (and thus be granted a different ship and ship abilities), your race choice doesn’t determine who you’re working for. Instead, the game always places you in the role of a Drox Operative – a representative of a powerful but clandestine guild, seeking to expand their power from behind the scenes rather than openly warring with the various races in the game. Whether by diplomacy, economic power or sheer brute force, your job is to get all the major powers in your sector nicely lined up and in the ideal situation for the Drox Guild to exert their influence. How you choose to go about doing this is up to you – your guild doesn’t care. They just want results. I’m a fan of what Soldak is trying to accomplish with a game like this, and I’ve always been able to forgive mediocre graphics in exchange for some good, solid gameplay – and that proclivity helps out here, because really… the game’s visuals are thoroughly average. They get the job done – a ship looks like a ship, a mine looks like a mine, and most of the icons are easy to figure out after some exposure. But at the end of the day, Drox Operative was made by a hard-working but still indie company that doesn’t even try to make a game that’s amazing in terms of graphics or audio. The interface, however, is a little overwhelming on an initial play-through – this is a game that would have benefited greatly from an in-game tutorial. Reading the manual actually helped a lot, and in fact I’d say it’s a requirement for all but the most discovery-inclined gamers out there. Hey, some of you like to just play a game and figure everything out without having to consult documentation – I can respect that. Combat’s a little bit on the straightforward side as well. 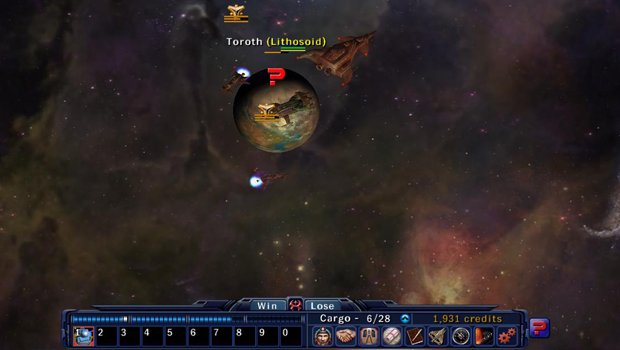 While you can get a wide variety of loot to build your ship up with (complete with randomized stats, tiers of rarity and the need to identify objects – more Diablo-style fun here), and a selection of different stats to invest points in as you level up, the actual combat tends to unfold in a supremely direct manner. You press one of the number keys to fire whatever weapon you’ve installed in the given slot, the weapon can either auto-target or target enemies with a mouse-click, and from there it’s just a matter of paying attention to your health, knowing when to flee and when to stay put. As with a lot of games like this, the bulk of the combat excitement takes place in how you build your character (or in this case, ship) up well before combat takes place. Once you’re in a conflict, you find out whether your strategy and build is going to work, period. There’s not much of an emphasis on turning the tide of battle with brilliant tactical maneuvers. All in all, I enjoyed Drox Operative. It’s a niche game, certainly – graphically bland with some intriguing gameplay that situates itself somewhere between a realtime strategy game and a roguelike style RPG, offering a whole lot of replay value to those who end up getting into the game. On top of this, it’s priced on the cheap side – $19.99 will get you the game in both Mac and PC versions, straight from Soldak itself. If you’re still not sure whether the game is for you, I recommend checking out the demo to use as the final judgment call. This is truly a unique game, and is worth a look for any RPG fans with a thing for randomized, dynamically generated worlds.